Footballer. Activist. Politician? Jason Ball doesn’t care about labels. He used to be known simply as one of the first out gay Australian Rules players in Australia, but now he has become so much more. It’s been almost six years since Ball came out publicly to the world. 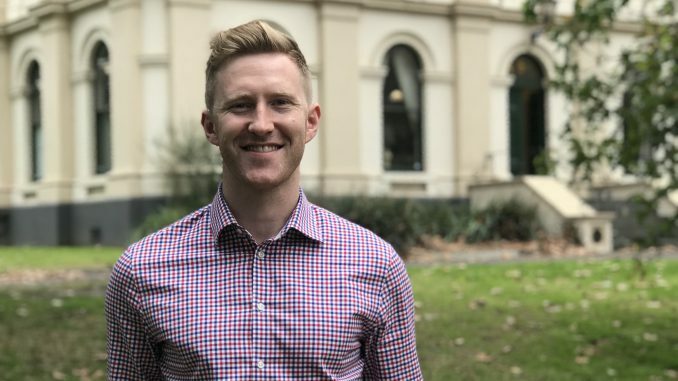 Since then he was named the 2017 Young Australian of the Year for Victoria; he stood for the Australian Greens as a candidate in the 2016 federal election; and in 2014 he launched the successful Pride Cup, which focuses on the celebration of inclusion and diversity for LGBTI people. “I think labels are important, because if I would’ve known a gay footballer as a kid, that would’ve made a really big difference to me. You can’t be what you can’t see,” Ball says. Ball started playing football at age six for his local team Yarra Glen, and despite a promising career, he made the decision not to pursue a future in AFL after high school. “I told my parents that I wanted to go to uni and travel and do other things, but really I think a big part of it was that I felt like I couldn’t be openly gay and play football,” he says. Like many people in the LGBTI community, he was worried that he wouldn’t be accepted by his family and friends if he came out. He was terrified when he realised he was gay as a young teenager in the country, because of the way others spoke about ‘gay’ as meaning something negative. He made a promise to himself that he would never act on those feelings, and for a number of years growing up, he hoped that his sexuality would be something that he could ignore or change. Self-acceptance could not come through any role models or heroes because there were no openly gay men in his country town, and he didn’t know any gay men who played AFL. After years of hiding and self-loathing, he gave himself the choice to either accept himself or end his life. “I ended up saying to myself, ‘If I only live one time I may as well do what makes me happy and be who I am, and if people don’t support me then that’s their problem’,” he says. The most difficult part of his journey was coming out as gay to his football team. Even though he was out to everyone else in his life, he went to great lengths to hide his sexuality from his teammates. “I would second-guess everything I said or did, I wouldn’t get involved in conversations about relationships or what I was doing on the weekend,” he says. Ball felt that the “macho environment” of the football club wouldn’t welcome him because homophobic slurs were common. Whether that language was coming over the fence, from the opposition, from his coach or his teammates, it was a constant reminder to him that he would never be accepted. When he was 22, his teammates actually reached out to him to say that they knew he was gay and that it wasn’t a big deal. After the weight was lifted off his shoulders, he could bring his partner to events and games, he played better and he felt more a part of the football club than ever before. “I came to understand that a lot of the homophobic language and behaviour that I was experiencing in that environment wasn’t coming from a place of hatred towards me or gay people, but a place of ignorance,” he says. After seeing the impact that his coming out story had on his team, he wanted to go public with it in order to be a role model for young gay kids too. He was persuaded to share his story with Jill Stark, a journalist at The Age who had a history of writing about homophobia in sport, and was awarded the Straight Ally of the Year award in 2014. Stark says that although she was worried that Ball wouldn’t be able to handle the media attention because of his age and the significance of the story, she found him to be very mature. “I remember thinking straight away that this was going to be a game-changer because Jason looks like the boy next door,” she says. Stark says that it was a privilege to tell Ball’s story, but she was frustrated at editors who didn’t fully understand the story and the impact it would have. The article was put on page four of the Sunday Age, whereas Stark thinks it should have been on page one. However, it still made an impact in the media as TV crews turned up to Ball’s football training the next day. “He just knew how to handle the media and get his message across in a way that brought people with him rather than creating division,” says Stark. Ball has evidently used that power through his recent career endeavours, championing the annual Pride Cup and becoming a candidate for the Australian Greens in Higgins at the 2016 federal election. He is standing for the Greens again at the next election.